Now the photos are all digital, both taken by our faithful smartphone (more and more real digital camera) is taken by SLR or other devices with lens (like the action cam). But what to do with it after sharing them on social networks? We can restore the ancient custom of keeping photos inside the frames, just as decades ago; the only difference is that this time on our bedside we will put a digital photo frame, able to view the photos in a decidedly more technological. Nothing could be simpler: a frame that, instead of the analogue photo, presents an LCD monitor where you can view (both individually and in presentation mode) all our photos. The simplest digital frames have only the memory card reader for the most popular formats (SD, microSD and others), while the more modern ones can have WiFi module, Bluetooth and also other additional features such as alarm clock, FM radio and background music. Perhaps there is absolutely no better brand of digital frames, each one offers on the market valuable or less sophisticated products. But spending a minute of one’s time properly informed, even before making a purchase that is not too demanding, can be an advantage in terms of personal satisfaction to avoid the risk of bringing home a product that does not respond to our needs or desires. The price sometimes suffices to understand if the resolution of the display will be sufficient or not to enjoy a pleasant reproduction of the images, but it is not the only element to keep under control. The quality of the screen, the construction material and the technology supported, are the key elements to take into account when buying. Check the resolution declared by the manufacturer that usually settles around 800 x 600 pixels, but can reach up to 1024 x 768, and if you are an amateur photographer, you will like to see all the details of your shots. The size and type of the screen directly influence the quality of the images. The LED ones are brighter than the liquid-crystal ones. With built-in or no commands, which can be loaded directly via devices such as external HD or USB stick, each one has different characteristics of use. Compare prices, but also pay attention to the possibility offered by the supplied software to set up accessory functions, such as the possibility to program switching on or off, or decide which photos to play based on the time of day. Even the ability to retouch just the photo is only supported by some models, if you’re a perfectionist, you will not escape the advantage of changing the effect of the photo directly before putting it on the air. How many things can you do? The ranking of the best devices compile you according to your taste and your needs, but in the review of the essential features that we like to find in a digital frame there is also the possibility of exploiting the device in various ways. Those that also offer the viewing of video or the reproduction of audio files during the tracking of the photos, add that extra touch that makes this digital evolution of the classic photo frame very precious. Here is a list of the 10 most sold digital photo frames currently on, constantly updated automatically day after day. 1 NIX Advance Digital Photo Frame 8 inch X08E. 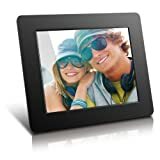 Electronic Photo Frame USB SD/SDHC. Digital Picture... 4,565 Reviews $89.99 $79.99 See Offers! 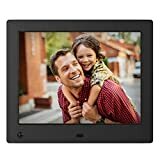 2 Pix-Star 10.4 Inch Wi-Fi Cloud Digital Photo Frame FotoConnect XD with Email, Online Providers,... 2,013 Reviews from $339.90 See Offers! 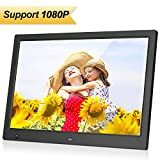 3 MRQ 13.3 Inch Digital Photo Frame, 1280x800 HD Picture Video(1080P) Frame with Auto-Rotate, Motion... 34 Reviews $129.99 $99.99 See Offers! 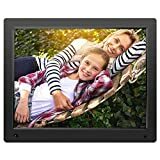 4 NIXPLAY Seed Digital Photo Frame WiFi 10 inch Widescreen W10B. Show Pictures on Your Frame Via... 3,364 Reviews from $169.99 See Offers! 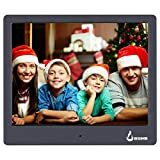 5 BSIMB M12 Digital Picture Frame Digital Photo Frame 8" LED Display Hi-Res Digital Photo & HD Video... 123 Reviews $69.99 $57.97 See Offers! 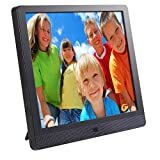 6 Aluratek (ADPF08SF) 8 Inch Digital Photo Frame - Black 852 Reviews $49.99 $34.99 See Offers! 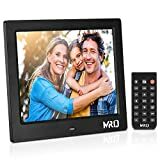 7 MRQ 8 Inch Digital Photo Frame, Upgraded 1024x768 HD IPS 180 Degree Wide Viewing Angle 4:3... 53 Reviews $119.99 $53.99 See Offers! 8 Nixplay Original 15 inch WiFi Cloud Digital Photo Frame. iPhone & Android App, Email, Facebook,... 1,467 Reviews from $309.99 See Offers! 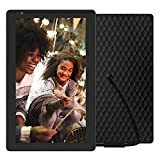 9 Skylight Frame: 10 inch WiFi Digital Picture Frame, Email Photos From Anywhere, Touch Screen Display 235 Reviews $159.00 See Offers! 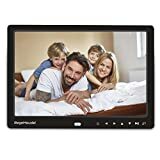 10 RegeMoudal 12 Inch Digital Photo Frame Picture Frame with Remote Control 1080P High Definition,... 119 Reviews $149.99 $89.99 See Offers!